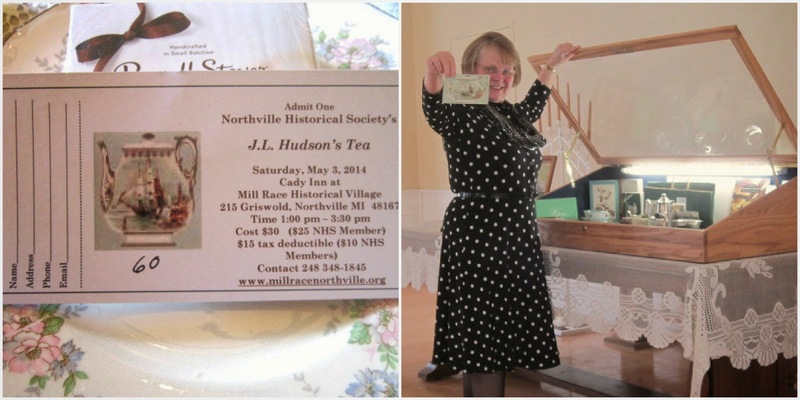 Last January, I was contacted by the Northville Historical Society to give my J.L. Hudson Department Store presentation at Mill Race Historical Village. The photo below is Cady Inn. The saltbox style building is believed to be an early coach stop. 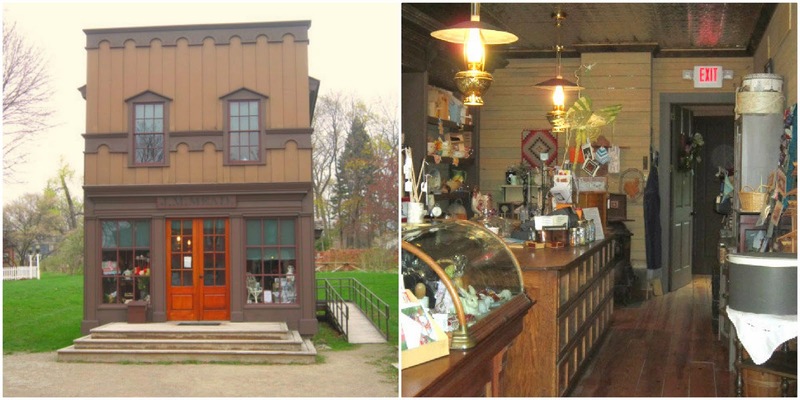 It was moved to the village in 1987, and it's where the Northville Historical Society offices are located. It's also where the Afternoon Tea was held on Saturday which preceded my Hudson's presentation. The Village has been designated a Michigan Historical Site. The property was given to the City of Northville in 1972 by the Ford Motor Company. In the right photo below is a Blacksmith Shop and Livery Stable, stone structure; Wash Oak Schoolhouse, blue building built in 1873 and moved to the Village in 1975; and New School [Presbyterian] Church, white building built in 1845. The church building is where my presentation was held. I set up my display case before the tea started at 1:00 p.m. My presentation began at 2:30 p.m. The building served as a church for only four years, then was used as a school, township hall, Salvation Army barracks, and the Northville Library for 70 years. 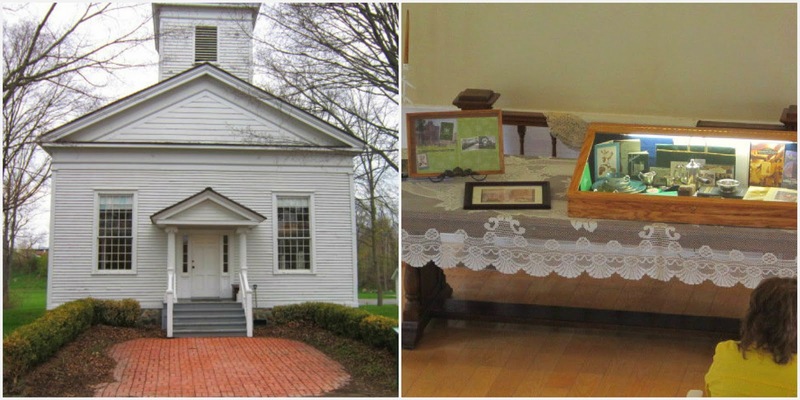 The Northville Historical Society was formed in 1964 to save the building from demolition, and it was moved to the Village in 1972. Below - J.M. Mead General Store, built between 1830-1850. It was reconstructed with original materials in 2010. It is presently the gift shop, and sits directly across the street from Cady Inn. There are other houses in the village, but due to time limitations and the drizzly weather I didn't photograph them. 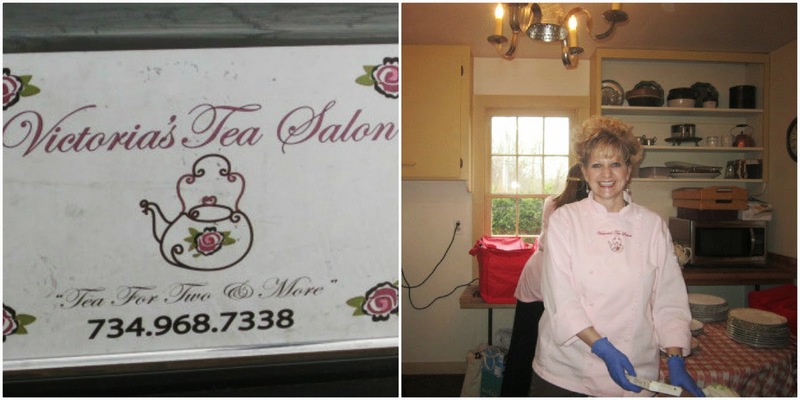 Below is Vicky O'Neil, owner of Victoria's Tea Salon Catering. 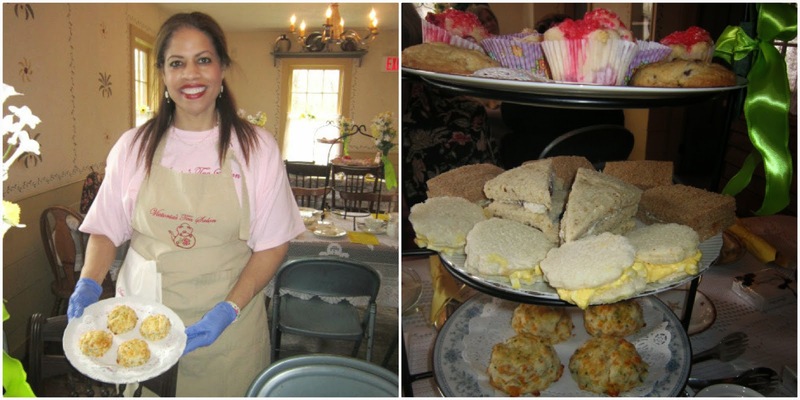 She prepared the delicious food for the Afternoon Tea. Left: Vicky's staff assembling Maurice Salads. 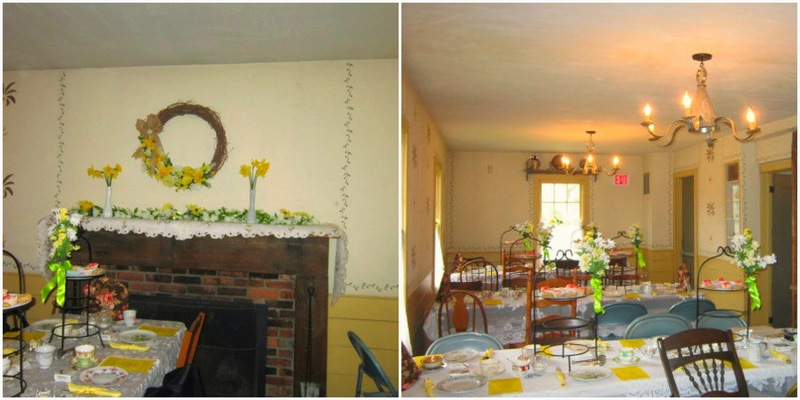 Right: One of the Cady Inn rooms set up for Afternoon Tea. Cady Inn is ready to host Afternoon Tea. I love the fresh, cheery daffodils! 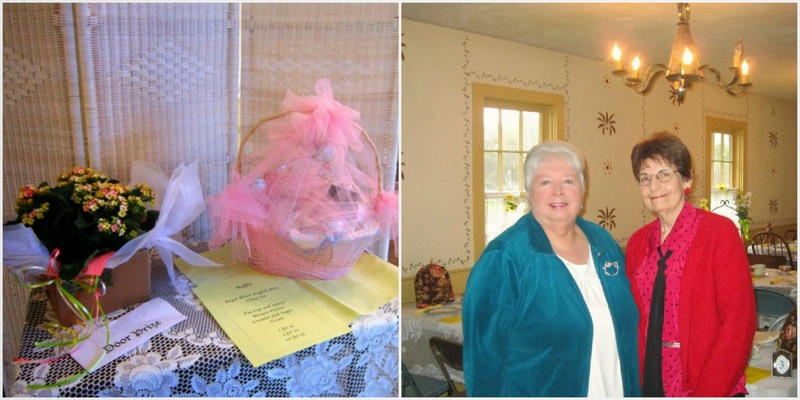 Left: Door Prize and Raffle Gift Basket. Right: Tillie Van Sickle and Pat Allen, Historical Society Members. Tillie is the lady who contacted me about speaking. 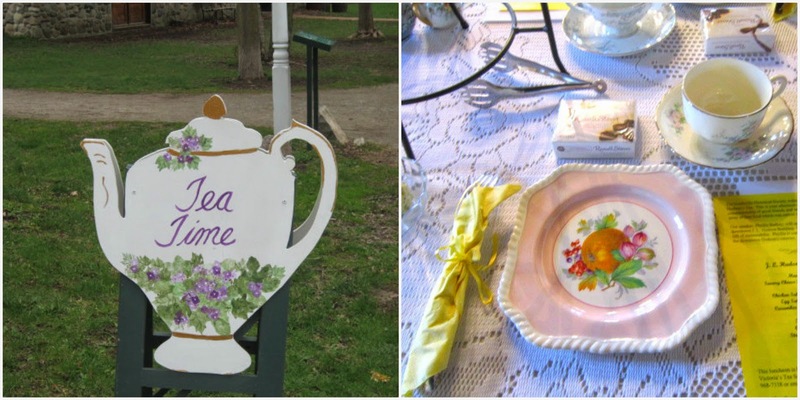 Left: Tea Time sign in front of Cady Inn welcoming the attendees. Right: Beautiful eclectic china place settings. Left: Savory Cheese Scones. Right: Three Tier Server. Bottom - Savory Cheese Scones; Middle - Chicken Salad Sandwich on Oat Nut Bread, Egg Salad on White Bread, and Cucumber on Whole Wheat Bread; Top - Toll House Cookie, Coconut Custard Pie, and Strawberry Mini Muffin. 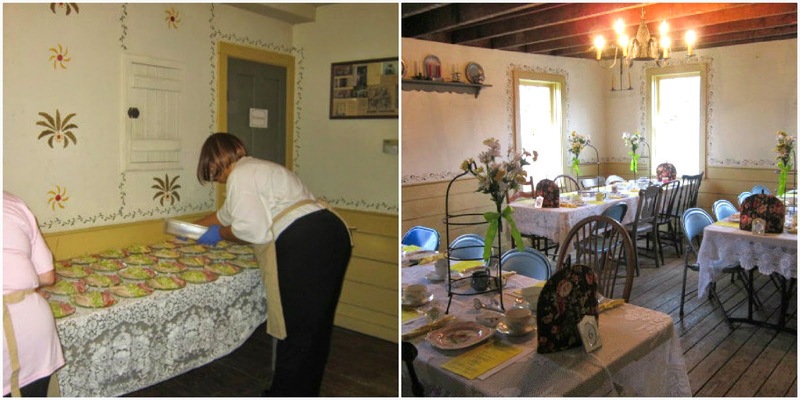 Tea was a Raspberry Black Tea called Cady House Tea, blended especially for Mill Race Village, and available for purchase at the General Store. Left: Menu. 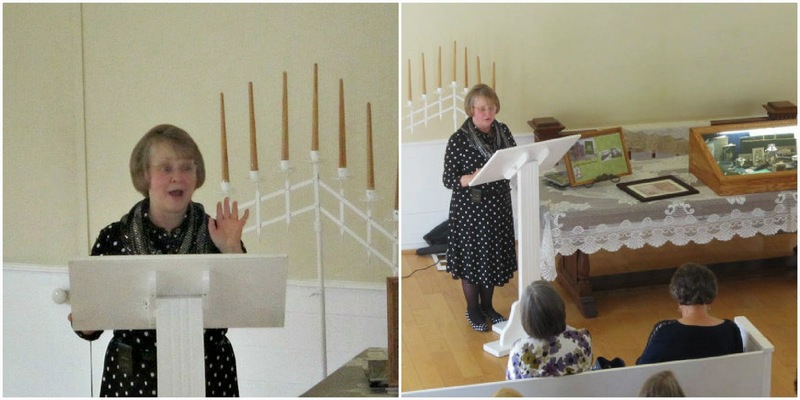 Right: Vicky telling the ladies about the Afternoon Tea recipes found in a Hudson's cookbook. 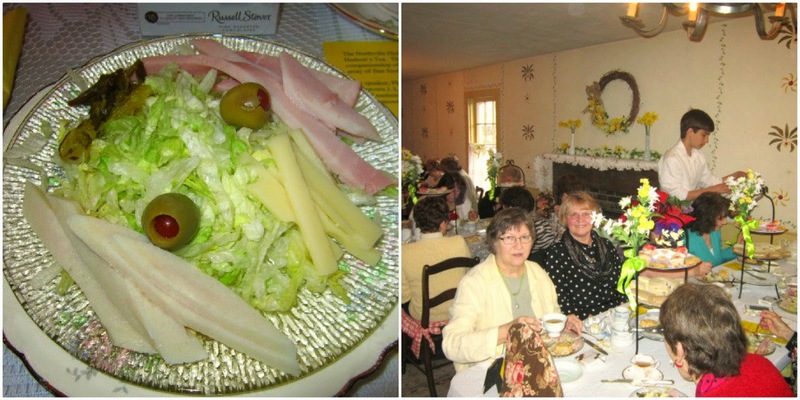 Left: Hudson's signature Maurice Salad - Ham, Turkey, and Swiss Cheese; Right: My table at Afternoon Tea. The teapot on the ticket at left, is the same teapot that's on the vintage Hudson's advertising trade card in my collection. I love that Hudson's used a teapot on their trade card. 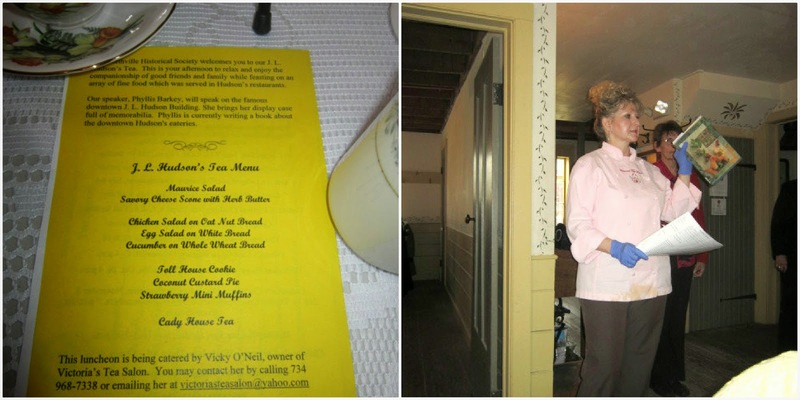 Following the tea the 63 ladies walked the short distance from Cady Inn to the church for the J.L. Hudson's presentation. Special thanks to the Northville Historical Society for inviting me to share a nostalgic subject that Metro-Detroiters love - J.L. Hudson's Department Store! What an interesting village, and a great setting for your presentation. The tea goodies sound and look delicious, and I'm sure they were! Well done Phyllis. A wonderful tea first and then your interesting presentation. I like the dress you wore, wish I could have attended. I would love to visit there someday. The Cady Inn is just adorable, from the walls to the furniture. The food looks devine! And the church is the perfect place for a presentation. It looks like a wonderful day! Thank you for introducing us to the facility, the caterer and for sharing your presentation! 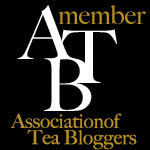 Please stop by and see the tea I attended with a Downton Abbey theme. Oh, I'm so sorry I missed this! I will contact you soon about getting together! You *know* how it warms my heart when I hear you are out sharing all that lovely Hudson's history! What a great time everyone must have had! Now, why am I suddenly craving a Maurice Salad??? 600th Post and a Giveaway!